In all clinical disciplines, there is an increasing emphasis on minimal tissue intervention. To mention but a few examples, orthopedic and general surgeons and anasthesiologists apply minimal tissue injury with different types of endoscopes and spinal anesthesia for clinical indications that previously demanded more traumatic surgery and full narcosis. Tissue Preservation in Clinical Dentistry represents a modern and timely approach in odontological treatment. Our focus in the third millenium will be more patient-oriented than before. Conservative dentists may like the drill because of its capability of treating a clinical problem with maximal comfort - for the dentist. In the foreseeable future, drilling may remain a necessary treatment procedure, but it should be used as little as possible since patients, generally, prefer a more gentle approach. This book has more than 30 contributors from 9 different countries. The main emphasis is to cover all sorts of minimal intervention, including the use of fluorides, ozone, and various types of mild chemical treatment in prevention and treatment of carious lesions. One chapter is devoted to describing what is meant by absence of caries, whereas others deal with the atraumatic restorative treatment approach and esthetic, direct restorative materials. A full section of the book presents a novel chemomechanical agent - Carisolv - used for caries removal, with special emphasis on the safety and efficacy of this procedure. Clinical chapters deal with this agent in general treatment of caries at universities and private centers. It is obvious that in trained hands, this approach to treating caries is not much slower than the conventional drill. Particular indications for chemomechanical treatment of caries are covered in individual chapters on deep cavities, root surface caries, and treatment of pediatric carious lesions and mentally disabled patients. 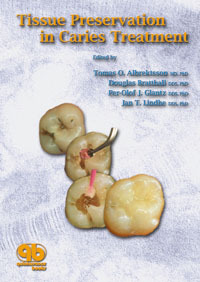 The book ends with a most interesting section on caries trends of the future on the global scene, including developing countries, another chapter focussing on the necessity of remaining flexible in a mobile world, and, finally, in the last chapter a discussion about future possibilities of using DNA chip analyses in dentistry. This book is oriented towards general dentists as well as specialists. Most of the chapters provide interesting information for undergraduate students, since minimal tissue intervention represents an approach of great importance for the future treatment of caries.